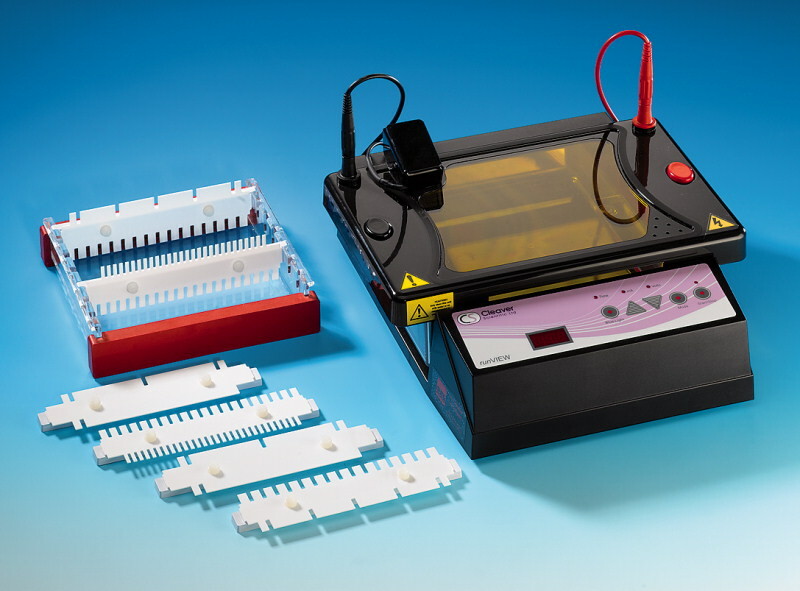 Innovative, new all-in-one system for electrophoresis - with integrated Power Supply and illuminator. Stained DNA is made visible during the run by excitation with blue light of 470 nm wave length and a special lid with integrated emission filter for green fluorescence. Another special lid with an intergrated ethidium bromide filter is available as accessory (Art. No 8549.1). DNA stained during the run by Roti®-Load DNAStain (green), ethidium bromide (red), or SYBR® Green (green), can be watched in real-time without having damaging effects caused by short wave lengths. Delivery incl. 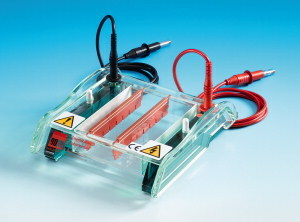 Rotiphorese® PROfessional runVIEW Base (base station with integrated blue light and power supply), horizontal gel unit Rotiphorese® PROfessional III, special lid for blue light with integrated spectral emission filter (green filter) and electrophoresis power leads (4 mm plugs), 1 UV-transparent gel casting tray (15 x 15 cm) with gel casting gates, and eight double sided combs: 2x 4-sample / 16-sample (1 mm); 4x 20- / 28-sample (1 mm, multichannel compatible); 1x 4- / 16-sample (3 mm); 1x 20- / 28-sample (3 mm, multichannel compatible). Delivery includes: horizontal gel chamber, safety lid with integral power leads, two gel casting gates and two combs (1.5 mm; 8 teeth).